The full head casting kit contains all the materials you'll need to produce a head cast including the neck and the tops of the shoulders. This kit does NOT contain a bald cap (we don't know what size you are), or mixing tools like a Jiffy Mixer and a mixing bucket. This is a very fun project for both model and lifecaster. It is not a difficult project, but there are a lot of steps that must be followed carefully. Procedure takes approx. 50 minutes. The model is only needed for about 30 minutes. This is the very same type of full head casting used in theatre and film for producing highly imaginative Special Effects Makeup appliances that turn actors into aliens, monsters or old people. This is a two piece mold process. 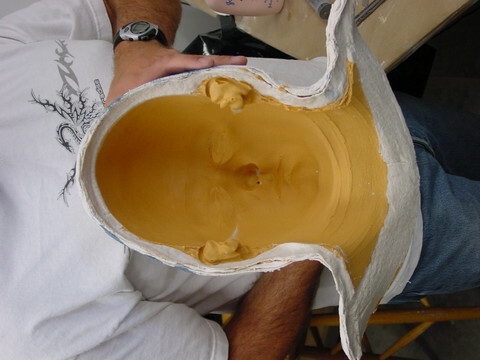 The back half of the head is covered only in plaster bandages and the front half includes the high level of detail only obtainable by using alginate. 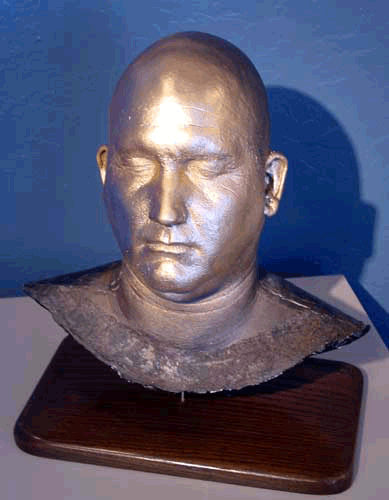 The finished head casting weighs about 30 pounds. It can be mounted in many different ways and can be painted any color you wish. This is a pro-level skill that, once mastered, is in high demand in the Special Effects Makeup industry as the first step in creating those amazing aliens, zombies and monsters. The full head casting is an advanced skill that is in high demand in Hollywood and anywhere special effects makeup is done. If you'd prefer to start with a simpler project, try our Face Casting Kit. Learning is a cumulative process and starting with a more modest project would not be money wasted.